Anthony Trollope is wrong about this, obviously. Novels can serve many purposes and work in many ways and touch neither the heart nor the tear ducts and yet be well-done work. Set that aside, because Trollope’s 1879 essay “Novel-Reading” is a catholic, expansionary essay. Trollope is defending sensation novels (“If there be such truth, I do not know that a novel can be too sensational”), not limiting novel-reading but extending it. That he has not quite absorbed Zola or The Good Soldier is not relevant. Trollope, author, by this point of how many novels?, is telling us what he is trying to do in his own novels. Sometimes they have scheming villains and tricky plots, but sometimes, and I’m thinking of The Warden (1855), since I recently reread it, he does without villains or external obstacles of any sort. A clergyman has a crisis of conscience. He has to work his way through it. That’s the story. The Trollopean reader will find himself at least a bit sympathetic with every character, except, possibly, hilariously, guest stars Thomas Carlyle and Charles Dickens. In this way, George Eliot resembles Trollope, at least in her early novels. Maitzen excerpts what looks like the non-dull portion of “The Natural History of German Life” (1856), written just as Eliot is turning to fiction herself. The essay is a defense of fictional realism, particularly regarding peasants and rural life, and an attack on “idealized proletaires.” She has some justifiably sharp words for Dickens – “his frequently false psychology, his preternaturally virtuous poor children and artisans, his melodramatic boatmen and courtezans” (124). Since she cannot yet offer Adam Bede or Silas Marner as evidence, she turns to the finest scene in Walter Scott’s The Antiquary (1816) to show us the way the life of the poor should be handled in fiction. Rohan is reading The Antiquary for the Scotch Challenge now, so let me save that. What’s interesting here, actually, is that Eliot’s notion of realism is directly tied to some idea of sympathy. True realism, including coarseness, selfishness, and whatever other ugly qualities are part of the portrait are the only path to true sympathy. “Appeals founded on generalizations and statistics require a sympathy ready-made, a moral sentiment; already in activity; but a picture of human life such as a great artist can give, surprises even the trivial and the selfish into that attention to what is apart from themselves, which may be called the raw material of moral sentiment” (123). The trivial and selfish person here is, unfortunately, me, the reader. I think this is the right path, that we are often surprised into sympathy in fiction. What a complication – we need not the artist, but the great artist. I have identified Eliot as a leading figure of the International Sympathy Project, in which novelists around the world developed the techniques necessary to surprise the selfish reader into sympathy. The writers in The Victorian Art of Fiction barely seem to know that the rest of the world exists, aside from occasional mentions of Dumas or Sue or Hawthorne. In the last two essays, by Henry James and Robert Louis Stevenson, the fog in the Channel has finally lifted, so Turgenev and Flaubert are as likely to be mentioned as Dickens and Thackeray. I don’t blame the earlier writers for having more parochial concerns. I just want companion anthologies: English Writers on Non-English Fiction. Non-English Writers on English Fiction. More, more. Monday is Memorial Day, so Wuthering Expectations will take the day off. Although The Victorian Art of Fiction devotes as much space to useful discussion of Dickens, Thackeray, and Eliot, I most enjoyed the attention paid to Charlotte Brontë. The anthology includes two essays exclusively about Brontë, and she receives substantial treatment in several others. What’s fun about Brontë is that she made readers, whether they liked her or not, uneasy. The reviewer recommends that Currer Bell “ be a little more trustful of the reality of human goodness, and a little less anxious to detect its alloy of evil.” As an aside, one of the reviewer’s lines about Jane is a classic: “Never was there a better hater” (18). Margaret Oliphant, writing in 1855 is similarly taken with Brontë and similarly nervous. C. W. Russell, a Catholic priest, acknowledges the power of Brontë (“this strange, and, with all her power, unpleasing and unamiable writer”, 100) but is willing to take the next step. In “Novel-Morality: The Novels of 1853” he argues that Brontë’s novels are plainly irreligious, and, particularly, anti-Catholic. His position is narrow but specific, and he uses the actual text of the novels as evidence, which is more than Leslie Stephen can bring himself to do. Simply! More or less! I said “insidious” because of Stephen’s method of argument. He begins reasonably enough, but on each page rotates the frame slightly. The balance between the life and works shifts, bit by bit, until, by essay’s end, Stephen takes the novels as nothing more than biographical evidence of pathology. The nadir is his use of the confession scene in Villette, “a true story, like most of her incidents” (274), which provides evidence of “a mind diseased,” by which I think Stephen means “uneasy,” and which is true, if the mind is that of the fictional Lucy Snowe, rather than the non-fictional Charlotte Brontë. More juicy Stephen tidbits. If Brontë were better read in philosophy “her characters would have embodied more fully the dominating ideas of the time” (262), which Stephen apparently thinks would be a good thing. Emily and Wuthering Heights make their only appearance in the anthology, to be dismissed this way: “Emily Brontë’s feeble grasp of external facts makes her book a kind of baseless nightmare” (273). Rochester “ is in reality the personification of a true woman’s longing (may one say it now?) for a strong master” (271). The lessons of Brontë’s novels “imply a blasphemy against the most divine instincts of human nature” (274). Leslie Stephen is not Charlotte Brontë’s ideal reader. I paid special attention to the writings about Charlotte Brontë because of a preposterous idea I have been ponderating about Villette, which has led to an even more preposterous idea about Jane Eyre, all of which would take some real effort to put in order, even for mere blog posts. I worry that I have badly misread her – why else has no one else seen what I see? Stephen’s essay build my confidence. Maybe I’m misreading her, but I’m not alone. We used to regard novels as ephemeral; and a quarter of a century since were accustomed to consider those by Scott, with a few others which, from Robinson Crusoe downwards, had made permanent names to themselves, as exceptions to this rule. Anthony Trollope is, in his 1879 essay “Novel-Reading,” celebrating the publication of collected editions of Dickens and Thackeray. I don’t know how many dozens of novels Trollope had behind him at this point but I can somehow sense Trollope’s satisfaction that he, too, will someday be represented in a diligently-edited uniform edition, as will Charlotte Brontë and George Eliot and George Meredith and any number of other deserving writers. Trollope never actually writes that. I’m reading between the lines. It’s a self-satisfied essay. Individual novels may be bad, or even bad for the reader, but “the novel” is a good thing. The old argument about the morality of the novel is over. On the first mild – or, at least, the first bright – day of March, in this year, I walked through what was once a country lane, between the Hostelry of the Half-moon at the bottom of Herne Hill, and the secluded College of Dulwich. Then: a spring, duckweed, “sundry curious little skipping shrimps,” “sometimes a tittlebat.” We seem to be nowhere near the topic of fiction, unless Ruskin is actually writing a novel. What is Croxsted Lane like now? Now Ruskin really gets going: “heaps of – Hades only knows what… mildew of every unclean thing… back-garden sewage” ending with the worst insult, “remnants broadcast, of every manner of newspaper, advertisement or big-lettered bill, festering and flaunting out their last publicity in the pits of stinking dust and mortal slime” (298). All right, now I get it. This is a metaphor! Of what? Ruskin’s marvelous childhood lane has been destroyed by his arch-enemy: London, the home of misery, infection, and decay. Cities destroys landscapes, people, and, it turns out, fiction. Fiction, and its writers and readers, now worship “the Divinity of Decomposition” which is “concerned only with the regenerative vigour of manure” (300). Who is Ruskin talking about? Amazingly, after a glance at Balzac, Ruskin launches directly into Charles Dickens, into Bleak House! Urban readers can now only be entertained by “varying to his fancy the modes, and defining for his dulness the horrors, of Death,” which Dickens happily provides, as Ruskin demonstrates in his hilarious list of the fatalities in Bleak House: “One by assassination; One by starvation, with phthisis,” and so on, all of which is “properly representative of the statistics of civilian mortality in the centre of London” (301). At this point, the essay, becomes, a bit strangely, a defense of the “healthy mind” of Walter Scott, who of course did not write much about cities, and did not write at all about the morbid horrors of modern urban life. Ruskin excepts a few other novels, based on no principle that I can see. Oliver Twist is fine (“earnest and uncaricatured”) but Victor Hugo’s Notre Dame de Paris is “the effectual head of the whole cretinous school,” which is bad, I guess. Which bothers Ruskin more, the loss of fortifying Scott-like fiction, or the loss of Croxsted Lane? It’s all the same thing, really. To Ruskin, cities destroy everything. The novel is traditionally the product of modernity, but to Ruskin it is just another casualty of modern upheavals. Halt “progress,” and then you’ll get your good fiction back. John Ruskin is always – what do I want to say? – a provocative and useful challenge to me. The writers collected in The Victorian Art of Fiction are concerned, mostly, with the Victorian art of fiction. But hovering over or buried under every piece is the shelf of novels by the Author of Waverley. Walter Scott is omnipresent, he or one of his characters referred to in passing, repeatedly, as if the reader were obviously familiar with Scott’s Collected Works. Scott has the largest entry in the index, followed closely by Shakespeare, Dickens, and Thackeray (and then: C. Brontë, G. Eliot, E. Bulwer-Lytton, J. Austen). I’ve gone on and on and on some more about Scott’s enormous place in literary history, far out of proportion to the quality of his novels. When literature professor David Masson claimed, in 1859, that "[Scott’s] influence is more widely diffused through certain departments of European and American literature than that of any individual writer that has recently lived…" (161), he did not need to argue his case. Everyone knew it. Working my way through these essays I learned that Scott was actually more important than I had thought. Scott singlehandedly transformed the debate over the moral worth of the novel. Before Waverley (1814), the novel was a morally dubious and/or artistically null form, brushing aside certain exceptions. After Waverley - not immediately after, but soon - the weight of the argument, the momentum, turned. Now the exception that had to be denied was Walter Scott, who somehow was no longer the exception but the rule. The anonymous author of “The Progress of Fiction as Art” (1853) writes “In the whole range of fiction it would be impossible to mention any author, the tone of whose works is so thoroughly healthy and pure as Sir Walter Scott’s” (68) and means it. Not Dickens, for example, or Austen, or Samuel Richardson. "Thouroughly healthy and pure" is not quite the recommendation it used to be. Masson argues that Scott’s stature as a poet was crucial, that he was able to transfer his acknowledged worth as a poet onto prose fiction, something not available to Austen or Maria Edgeworth. I have no idea if this is right, but it’s plausible. The result, according to Masson: “Prose Fiction assumed, in consequence, a higher relative dignity; nay Prose itself could be conscious of having advanced its several stages nearer to the very citadel of Poesy” (162). The high value of Scott recurs throughout The Art of Victorian Fiction. Walter Bagehot (“The Novels of George Eliot”, 1860) can pay Eliot no higher compliment than incessantly comparing her to Scott. Henry Mansel (1863), amusingly, indicts the readers of sensation novels for not reading Scott (209). John Ruskin’s head-on attack on the very practice of novel reading carves out an enormous exception for Scott. It’s all been downhill since Walter Scott, Ruskin writes in 1880, sixty-six years after the publication of Waverley. I want to note that, unlike his role in the spread of the historical novel, Scott’s influence on notions of the moral value of fiction does not appear to be an international phenomenon. By the time Scott turned to fiction, Goethe, for example, had published three novels, one of them forty years in the past, and a wide range of German Romantic fiction writers were working in all sorts of fascinating directions. German fiction needed no assistance from Walter Scott. * Austen, in these essays, is universally loved. Everyone goes gushy over Austen. George Henry Lewes (1852): “as an artist, Miss Austen surpasses all the male artists that ever lived” (49). That’s typical. This week’s text will be The Victorian Art of Fiction: Nineteenth-Century Essays on the Novel, Broadview Press, 2009, ed. Rohan Maitzen. We all know Rohan as the proprietor of Novel Readings, but here we have a book she edited, an anthology of twenty-two Victorian magazine essays on the English novel. Rohan has supplied footnotes and deftly trimmed the essays. I was never too curious about what was under those ellipses, which I take as a sign of good trimming. The authors range from major novelists (Eliot, Trollope, James, Stevenson) to the scintillating A. Nonymous. The dates cover 1848 to 1884. The essays are diverse but not comprehensive. A story emerges, a debate takes place. Are novels good or bad? Meaning, novels as a whole – should one waste any time reading novels – and specific novels. Perhaps Charlotte Brontë is bad for you and George Eliot is good for you. Not that this debate has entirely ended, but we know which side won. The Victorian Art of Fiction helped me see the path of the argument. If novels are immoral, or if reading them is immoral, it is likely because so many are written by ladies. Or not. So a subtheme of the book is The Lady Novelist, with George Eliot’s “Silly Novels by Lady Novelists” (1856) and Margaret Oliphant’s “Modern Novelists – Great and Small” (1855), and others, pursuing the idea. Of course, the deck is stacked, with two not-so-silly lady novelists at the beginnings of their own careers surveying the field, thinking about not what lady novelists should do, but what Eliot and Oliphant should do. In later essays, George Eliot becomes an exemplar for the seriousness of the novel as an art form, and as a morally useful form. In the anthology, she becomes the foil for Charlotte Brontë, a writer who made critics nervous. Are her books good or bad, helpful or harmful? Emily Brontë is barely mentioned in these essays. Charlotte is apparently a sufficiently difficult problem. I’m going to write more about this theme, if for no other reason than to gape at Leslie Stephen’s baffling 1877 attempt on Brontë's books. The essays often work in pairs. They are chronological, so Rohan will have to tell us how that worked. George Eliot’s sly “Silly Novels by Lady Novelists” (1856) is followed by W. R. Greg’s “False Morality of Lady Novelists” (1859), who at first sounds as bad as his title, but improves. Anthony Trollope’s celebratory, even valedictory, “Novel-Reading” (1879) is followed by John Ruskin’s scathing, hilarious, utterly bonkers “Fiction – Fair and Foul” (1880), which functions in this anthology as the final scream of the “novels rot your brain” argument. And we end with Henry James and Robert Louis Stevenson civilly discussing what the novel can do (anything) and how, exactly, it can do it (now there’s the difficulty), two master craftsmen who could not take the novel more seriously. They win. I could try to write about William Morris’s Arthurian poems – “The Defence of Guenevere” or “King Arthur’s Tomb,” for example. The treatment of Guenevere is unusual, quite different than Tennyson’s. Or maybe I should look at the poems from Froissart’s Chronicles. “Sir Peter Harpdon’s End” or “Concerning Geffray Teste Noire.” I think I prefer those to the King Arthur stuff, though I’m not sure why. Morris wanted to reinvigorate medieval forms and subjects. His poems are either clipped epics – “The Defence of Guinevere” plunges right into her trial – or ballads, with refrains like “Two red roses across the moon” or “When the Sword went out to sea.” They convince me, meaning they feel authentically medieval yet simultaneously modern, contemporary with Robert Browning, for example. I could try to figure out how Morris does that. And then we walked together toward the golden gates, and opened them, and no man gainsaid us. Then one thrust me through the breast with a spear, and another with his sword, which was three inches broad, gave me a stroke across the thighs that hit to the bone; and as I fell forward one cleft me to the teeth with his axe. So these are very much the kind of thing you’ll like if you like this kind of thing. Dickens, Thackeray, Gaskell, Trollope, etc., certainly weren’t writing anything like them. George MacDonald was – I wonder if he knew them? To part at last without a kiss? Beside the haystack in the floods? Vivid, no? So this, I suppose, is why I want to read more William Morris. I found the early Morris works in Early Romance in Prose and Verse, ed. Peter Faulkner, J.M. Dent & Sons, 1973. Almost everything in the book was originally published in the Oxford and Cambridge Magazine, founded and edited by Morris, in 1856. The poems are also in The Defence of Guinevere, and Other Poems, 1858. 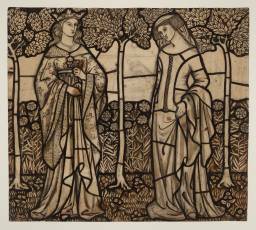 The William Morris image – a stained glass cartoon titled “Guinevere and Iseult” – is owned by the Tate. Tomorrow I’ll try to give some idea of how impressed I was with the early stories and poems of William Morris. They are not at all to my taste – I do not worship at the altar of Le Morte d’Arthur – but are keenly imagined and sharply written. For a self-published 22 year-old, they’re amazing. So I want to try some more William Morris, which turns out to be a problem. The Morris canon is a mess. His Collected Works make for an intimidating shelf. His Utopian novel, News from Nowhere (1890), is apparently a key text, and I know enough to read a few of his essays, like “Useful Work versus Useless Toil” (1884). But after that, chaos. The wild variety of Morris’s work must be part of the problem. It is easy to break him into pieces. Thus, I can easily find collections of his political writing, one of the central figures of English Socialism. Or I can read his thoughts on painting and design, often published alongside examples of his wallpaper and other designs. None of this is what I have in mind, is it, or only a part? I want William Morris the writer. Anyone have any warm thoughts about Morris, any advice? His late fantasies novels are occasionally brought back into print. I have no idea what they’re like. Let’s say I put The Well at the World’s End (1896) on my reading list. Is that a good start? Are others – The Glittering Plain (1891) or The Wood Beyond the World (1894) – as good or better? At least the fantasy novels are discrete books. The poetry is the real problem. After The Defence of Guenevere, and Other Poems (1858), the book I read, Morris abandoned short narratives and lyrics and turned to long poetic epics. The Life and Death of Jason (1867). The Story of Sigurd the Volsung and the Fall of the Niblungs (1877). The enormous omnibus of classical legends, The Earthly Paradise (1868-70). Morris anthologies include excerpts, which slice the books to ribbons. But they’re so bulky. Perhaps excerpts are sufficient. The idle singer of an empty day. I love how Morris modestly tells us what his giant poem is not – it’s not Paradise Lost, for example – and kindly informs us how to read it. I’ll do what he says, and perhaps give it a try when aweary of my mirth, but still feeling kindly unto all the earth. That’s a pretty specific mood, but one I know well. So why not just plunge into Argentinean literature, if it's so great, which it seems to be? The usual reason – too many books, or, really, too little focus. Restlessness and curiosity and susceptibilty. For example, I have to clear out some time for a novel or two or three by Margaret Oliphant. Why? Good question. She’s Scottish, and I claim to be interested in the subject, although she didn’t write much about Scotland. Frankly, though, I was happy to skip her, unless someone else insisted, or maybe just read her short Autobiography (1899). She wrote, Penelope Fitzgerald tells me, “nearly one hundred novels,” plus stories, articles, travel books, and more. * That’s not promising. But then I read the rest of Penelope Fitzgerald’s essays on Oliphant, introductions to the Virago editions of four Oliphant novels. Fitzgerald, reasonably, does not use her space to inform the reader of everything Oliphant does wrong. She is making the best case she can. That case is strong. The four novels are The Rector, The Doctor’s Family, Salem Chapel, and The Perpetual Curate. The first three were all published in 1863 – not promising – and the last in 1864. They are all part of the Carlingford series, about ministers and curates and so on in a small English city, very much like Trollope, except that Oliphant wanders further afield, into the working class neighborhoods, and even into the slums. Fitzgerald argues that Oliphant’s art, at its best, consists of the sorts of "minor incidents that lead to major psychological insights" that I also associate with Trollope. The Rector is the story of a new bookish minister who “[f]or the last fifteen years… has been immured in the college of All Souls, preparing an edition of Sophocles” (47). In other words, he’s a bad minister, and is about to learn just how bad. The climax of the novel is at the bedside of a dying woman. The rector, called away from a party, does not have his prayer book, and “is at a loss for a prayer.” He is helpless in the face of the woman’s need, and he understands that he probably always will be. This seems pretty sharp. I know, it’s just one scene, but still. Fitzgerald makes The Perpetual Curate sound even more interesting. Here, we have the priest who is too good, who ministers in other people’s districts and can’t keep his views to himself (he’s “viewy”), even when it means he’ll always be too poor to marry. A good priest, but not a saint – Fitzgerald singles out a scene where he “has to restrain himself from whacking his aunt’s horrible dog” (67). Fitzgerald suggests that Oliphant is actually at her best in her shorter work. She argues that the three-volume novel did not suit Oliphant well, leading to plenty and padding and contrivances and plottiness that were far from her strength, which was exactly my suspicion. But any reader of Trollope, or second-tier Dickens, for that matter, has hacked through plenty of underbrush to get to the good stuff. Fitzgerald convinced me. I need to sharpen my machete and read some Margaret Oliphant. *Penelope Fitzgerald, “The Mystery of Mrs Oliphant,” in A House of Air: Selected Writings, Flamingo, 2003, p. 69. All quotations are from this cornucopia of a book. And I don't want to omit Rohan Maitzen's omnibus reference post on Oliphant. Maitzen got me curious enough about Oliphant to read the Fitzgerald essays. Roberto Arlt’s Mad Toy is a short book – 130 pages or so – that packs in a lot of different pieces. They do not all mesh so well, but they all contribute to the messy energy of the novel. The tour of Buenos Aires, circa 1910, was as interesting to me as anything else. The markets, the shops, and the immigrants, all of those immigrants, Italians, mostly, but also Spaniards, Eastern European Jews, Turks, and who knows who else. The novel is drizzled with Italian and even a bit of Yiddish, as well as Argentinean slang. Buenos Aires was a rapidly growing city of immigrants. Some potted facts, which I should probably look up, so don’t trust me: at the end of the 19th century, Argentina had a higher proportion of immigrants than the United States. The per capita income was close to that of the U.S., too. It was right around then that a mismanaged financial crisis (which also affected the U.S. and Australia, but less severely) led to the divergence of income that we still see today. If the economic problems are mentioned in Mad Toy, I missed it. To an American, by which I mean a norteamericano, by which I mean a yanqui, Argentinean history is unusually interesting. It parallels the history of my own country in key ways – the immigrants, the frontier, the cowboys, the wars with indigenous people – that help me understand U.S. history better. I want to learn more about it. Argentinean literature has become best known for its fabulists and metafictionists – Jorge Luis Borges and Julio Cortázar and so on – which makes the instrumental use of literature as substitute history or sociology even trickier than usual. I’ve read a couple of the tiny novels of César Aira – Ghosts (1990) and An Episode in the Life of a Landscape Painter (2000). The latter is a historical novel, set in the 19th century pampas, featuring a “real” German painter, Johann Moritz Rugendas. But Aira is a surrealist, so even the apparently accurate map of Argentina that New Directions put in front of Chris Andrews’s 2006 translation of the novel is open to suspicion. And then later an Indian pretends to make out with a giant pink salmon (p. 71). So what I’m saying is, I want someone to organize an Argentinean Reading Challenge Readalong, starting with Domingo Sarmiento’s Facundo: Civilization and Barbarism (1845), moving on to the gaucho epic Martín Fierro (1872/1879) of José Hernández, and continuing with Leopold Lugones, Roberto Arlt, and then on to Adolfo Bioy Casares and Fogwill and so on. There’s an Argentinean writer who just uses his surname, which is “Fogwill.” Curious thing, Argentinean literature. So, to whomever sets this up, thanks in advance! The first sentence of Roberto Arlt’s Mad Toy (1926) tells the reader what he’s in for. It’s got literature, it’s got bandits from serialized adventure novels,, it’s got an immigrant and his work. Right away, it plunges you right into Buenos Aires – the colors of the stores, the ironically-deployed street names. And it’s not just the first sentence, but the first paragraph. Mad Toy is like a punchy newspaper column. Like a serialized novel in four short chapters. Arlt was a contemporary and pal of Borges. They were the young lions, tearing up Argentinean literature, disrespecting their elders and betters, running wild in Buenos Aires. Sounds like fun. Arlt unfortunately died young, though, age 42. Mad Toy is an energetic mess, which fits its brilliant, restless teenaged hero. He wants to be, and could be, a famous thief, or an inventor, or a writer. He hops from job to job, like Lazarillo de Tormes. The used book store in the second chapter is particularly hellish (warm thoughts to actual used book store owner Colleen), all abuse and drudgery, completely unrelated to the books that drew him to the job. Behind those doors was money. The shop owners would be sleeping peacefully in their luxurious bedrooms, and there I was like a dog, roaming the city by guess and by God. Trembling with hatred, I lit a cigarette and maliciously threw the burning match on a human mass that was curled up asleep in a doorway. A small flame skimmed along the rags and tatters. In a trice the wretch was upright, formless as darkness, and threatening me with his enormous fist. I hit the road. Is this a Cain or Hammett novel? This is only one mode of Mad Toy, though. The novel is a picaresque, a noir, a portrait of the young artist. It’s hardly a tightly wound perfect work of art, but it’s good enough that I want to read the other Arlt novel that has wandered into English. Translations by Michelle McKay Aynesworth, 2002, Duke University Press. Sanskrit, or Classical Greek, or Gilgamesh, are sufficiently distant from us, and the scholarship in the languages so well developed, that I perhaps take the role of translation in their survival for granted. I know there are people out there, and have been, for hundreds of years, laboring as caretakers of the language and literature. Yiddish, though, Yiddish is merely dying, not dead. I was just reading Ruth Wisse’s Little Love in Big Manhattan (1988), her recreation of the world of the young hotshot Jewish immigrant poets of the turn of the 20th century. Cool aesthetes or tricky satirists, shoemakers or bohemians, socialists or communists or Communists. What fun to be young, and in New York, and a poet – was there ever a time when that was not true? The Manhattan of the ‘00s and ‘10s, though, was unusual, because the city was the entry-point for the largest wave of immigration in American history. All of these immigrants arrived as young men, and whatever their theories or politics, between their new world of tenements and Yiddish newspapers and sweatshops and their old world of villages and pogroms, they certainly had plenty to write about. Every poet Wisse mentions was a secularist, but Jewish literature and history is everywhere in their poems. Wisse keeps her attention on two poets, the best ones, she argues, Moishe Leib Halpern and Mani Leib (no last name, there). Wisse provides generous excerpts from their work, which is essential, because as far as I can tell, there is only one collection of Halpern in English, and, for Mani Leib, none. None. I also read a few of their poems in an anthology of Hebrew and Yiddish poems, the name of which I have forgotten, which is slick work, kid. A grimy hand in the mussed-up hair. - A little love in big Manhattan. As good as it’ll ever be. That’s a bit of “Song: Weekend’s Over,” originally published in 1923 (I think). Wisse gives a few more stanzas, but not the whole thing. It’s slangy, the tone jerks around, and it’s obviously a headache to translate well. I’d love to read the whole thing. The one Halpern book, In New York: A Selection*, gives me about a third of Halpern’s first book, In Nyu York (1919). “In a Foreign World” is a poem about the voyage to America – every poet wrote one of these. “Our Garden” – “It takes a magnifying glass \ Just to see a little grass” – is typical of Halpern’s cheery pessimism about New York. Contrast to the old country, though: the fragments of the long vision of a pogrom, “A Night ,” are sufficiently strong to truly puzzle me. Why on earth is this not all in English? “A Night” is in the same tradition as H. Bialik’s “In the City of Slaughter”, or Jeremiah’s “Lamentations.” Paul Celan knew it. The poet is a schoolboy in Galicia, but also Moses, and Christ, although Christians bring only violence and terror. This poem is not cheery, or sardonic, just a nightmare. The little man hobbles again. He calls me king. He kneels. He asks me my desire. Soldiers after it – runs from afar. Among the drunks in a bar. Dang hard poem to excerpt. Soon enough – not for a long time, but too soon – the poems of Moishe Leib Halpern will only be available to readers with advanced degrees in Yiddish, or to readers of translations. Without translations, this literature disappears. In the long run, no language is immune. Translators keep culture alive. Maybe that’s too obvious a point. Reading Halpern and Mani Leib, I can hardly stop thinking about it. * Moishe Leib Halpern, In New York: A Selection, ed. and tr. Kathryn Hellerstein, The Jewish Publication Society of America, 1982. When I emphasized the social value of translation, independent of actual readers or reading, I was thinking of projects like The Clay Sanskrit Library, which has published over fifty volumes of English translations of Sanskrit literature in a uniform, attractive format. The project seems to be complete, which means, I think, that it ran out of money. This was a philanthropic enterprise. Please investigate this David Shulman article in The New Republic for more information. Who was all of this for? Students of Sanskrit, certainly. Each translation has facing page Sanskrit, in Roman script, and is lightly annotated. Who else? University libraries bought them. I can only guess about readers in India. Then there are a few restless readers like me. I’ve never noticed another book blogger reading one, at least, so I assume "few" is right. All of the work – the translation and scholarship and editing – was in the service of enlarging the opportunity of theoretical readers, future readers, maybe just that one reader whose life will be completely transformed by this stuff. There’s no money here, and the potential audience is tiny. Yet it is obvious to me that the mere existence of the Clay Sanskrit books is valuable. Our cultural possibilities are greater than they were, whatever that means. I’ve read three of them now – Ashvaghosha’s Life of the Buddha, the first volume of The Ramayana, and now the play How Úrvashi Was Won by Kālidāsa (translated by Velcheru Narayana Rao and David Shulman), supplemented by the Oxford World’s Classics version of Kālidāsa’s The Recognition of Sakuntalā, translated by W. J. Johnson. They have all been worth reading, although I would recommend that a first-time reader of The Ramayana start with a shorter retelling, like R. K. Narayan’s or William Buck’s. The Kālidāsa plays (4th or 5th century CE, maybe*) are both stories of noble couples united and separated and reunited. The Recognition of Sakuntalā was more melancholy, more serious, often resembling The Winter’s Tale. How Úrvashi Was Won is altogether sillier. Donald Frame, in the article I mentioned yesterday, talks in terms of percentages – no more than 20%, say, of a book can possibly be translated, and he’s happy if he gets to 15%. Those numbers seem about right for these plays, which would have included music and dancing (and costumes and sets and actors) all of which are left to my inadequate imagination. Nevertheless, 15% of something this good is worth experiencing. The fourth act of How Úrvashi Was Won is especially impressive, or odd, or delightful. It’s a solo mad scene, with the king wandering the forest looking for the lost Úrvashi, who has been turned into a vine, don’t ask. Has the cloud seen her? No? How about the peacock? No answer. The cuckoo? Other people’s sorrows don’t hurt us. It’s true what people say. The geese, the bees, the king of the elephants, the waterfalls, no one can help him. The king sings and dances through the forest, and his songs are sad but sweet, and somehow everything works out in the end. I’d love to see this performed. I’ve never read anything quite like it. * The imprecision of the dating of Sanskrit literature is in itself startling and marvelous to a Western reader. A prospect that is intolerably, inconceivably bleak - does translation matter? Some credentialing: Over here we find the admirable Orbis Terrarum Reading Challenge, which encourages geographically diversified reading. Books from eight different countries is the rule now, I think. I am not joining, on the principle that a challenge should be challenging. In 2010, I hit eight countries on February 19, with Tolstoy’s Childhood. Iceland, Norway, UK, US, France, Russian, China, and “German” – the notion of “country” is not so useful in 19th century Germany. Since then, I have visited Austria, Argentina, Chile, Spain, Mexico, Yiddishland, and Sanskritland. What I mean is, translation matters a lot to me. Not as much as it matters to Edith Grossman, who gets to chat with Gabriel García Márquez as part of her normal work day, but a lot. But any argument about Why Translation Matters has to move past personal taste, and has to contribute something beyond the important but obvious – that translation allows us to, say, read books in languages we don’t know. The best piece I’ve seen about Edith Grossman’s Why Translation Matters is by Chad Post, proprietor of the admirable Three Percent Blog, which is devoted to current literary translation and nothing but. Post’s essay is good reading just for his thoughts about the biz side of publishing, where he provides helpful context for Grossman’s complaints but also offers much more realistic ideas about what is really possible. He dismantles Grossman’s arguments that publishers have a “moral obligation” to publish translation (his term, not Grossman’s, but it’s accurate). What does translation offer to the reader? I must admit that much of my resistance to the Why Translation Matters part of Why Translation Matters is that I can’t stand this rhetoric. * The “we” in the first sentence makes me nervous, while “indescribable,” “inconceivably” and so on seem absurd. Everyone who stops by Wuthering Expectations for any purpose besides trolling for term paper ideas is well-read, in something, often in many things. Now, please, tell me if the absence of Pierre de Ronsard,** Lope de Vega, or Heinrich Heine from your life makes it intolerably bleak. I ask this as someone who has read in some depth into every writer on that list, my recent encounter with Paul Verlaine taking care of the last one (she got me with Bulgarian, though). Maybe the list meant to be purely metaphorical? It can’t be, though – imagine someone whose list of the writers he can’t imagine living without went: Poe, Hawthorne, Melville, Whitman, Dickinson, H. James, Cather, T. Eliot, E. Bishop, and so on. Is there some argument against that list? That's a good list! Some good readers do just fine without the help of translation. Is all of the weight on the word “opportunity”? The argument has to be based on opportunity, not on actual reading. The social value of translation is different that the individual value. Are you reading enough books in translation? Yes, you likely are, even if the number is zero. If that does not sound sufficiently absurd: Are you reading enough Sanskrit literature? Are you reading enough poetry? Are you listening to enough jazz? More of any of these virtuous cultural activities means less of whatever virtuous cultural (or non-cultural!) activity you are engaged in now. Reading more translations is not free - it means less of something else that is valuable. The social arguments for more, more, more translation, with which I agree, completely, do not actually depend on any particular reader. The social value of translation is very high; the individual value – well, that varies enormously. Someone has to read these books, but how many, or who, is another question. Chad Post, out on the frontlines, suspects that shaming people into enjoying literary translation (or poetry, jazz, Sanskrit plays, etc.) is not a long-run solution, which seems right. I put a high value on the remarkable Clay Sanskrit Library, and I am shocked and dismayed that no one is reading these books for a blog project. But does that mean that I did something remarkable when I recently read a couple of Kālidāsa plays? Should you feel bad if you haven’t read them, or that a great deal of Sanskrit literature has never been translated? The prospect is tolerable, and conceivable. The literary translator expands the possibilities of our culture. Good ones, like Edith Grossman, are invaluable, or at least greatly underpaid and underappreciated. Did I recommend her fine The Golden Age: Poems of the Spanish Renaissance yet? And Love in the Time of Cholera, what a book, right? And the second half of Why Translation Matters, I think many people will get a lot out of that. No more Why Translation Matters, but tomorrow, one more reason that translation matters. ** Several years ago, I combed through Ronsard translations. They ranged from serviceable to disgraceful. I wish Grossman had clued me into the good one. 3. Do not, ever, ever, ever, say that the book is “ably translated.” “Seamless” is also bad. 1. Check. I always mention the translator, even if I know nothing about him. Or at least, I always intend to mention the translator. 2. Ha ha ha ha ha! That’s ridiculous. How do I know that the translator is competent? If the translator is Edith Grossman (or a long list of others), then yes, I know. But what if I am checking not the translator’s accuracy, which Grossman insists, correctly, is close to but not quite the point of translation, but her decisions? When I spot-checked Pevear and Volokhonsky’s The Brothers Karamazov against Constance Garnett’s, I was startled to see how often the two versions were not only similar but word-for-word identical. Similar passages covered perhaps 90 percent of the novel. But that last 10 percent, that’s where the action is, that’s the difference between a mediocre translation and a good one. 3. Check! Assuming the blogger search function worked, anyway. Avoid these words which have become reviewer clichés. That’s my reason, not Grossman’s. Now excuse me while I congratulate myself for being a model reviewer of books in translation. Later in Why Translation Matters, Grossman goes after the reviewers again. Reviewers dismiss or ignore translations because they are ignorant – “they simply do not know what to make of them [translations], in theory or actuality” (47). Also, people in America, and publishers in England, are essentially xenophobic,* and The Atlantic magazine is provincial, and most reviewers are inept (all from the gleefully spiteful p. 51). So say that you, perhaps a book blogger, want to write eptly about a translated book? What does Grossman suggest you do? First, see points #1-3 above. Second (p. 48), be like James Wood, who in his 2007 review of Anna Karenina spent a lot of space discussing How Translation Is Done. The reason he did this is, of course, because he hardly ever writes about translated fiction anymore. Writing a general essay about translation every time one reviews a translation would be absurd. Third, treat translation is an “entirely separate genre, independent of poetry, fiction, or drama” (47). Dismiss your outdated Romantic attachment to authenticity. The translator is a creative artist in her own right. Yes, but. I want a second opinion on this. I’ve probably read more words translated by Donald Frame (Montaigne, Rabelais, Molière, Prévost) than by anyone. What does he think? Modest is right! He may undersell himself, but my sympathies are closer to Frame’s. Turn to Grossman’s translation of Don Quixote, an extreme but useful case. What is the greatest achievement of that novel? Is it linguistic – specific turns of phrase or expansions of the Spanish language? Or is it the creation of Don Quixote and Sancho Panza, characters who have managed the rare feat of detaching themselves from their own novel? I'm not supposed to give the translator credit for Don Quixote fighting the windmill, am I? I don’t know what Grossman actually wants me to do with this idea. Strike “ably.” got it. My own advice, and I’m entering into the spirit of Grossman’s argument here, is do whatever I do. Note that none of this has anything to do with Why Translation Matters. Grossman packs a lot into this small book. * The evidence for the “high degree of xenophobia rampant in our country” is a single gag bumper sticker, which “I am sure many of you have heard about and some may even have seen” (42). Whatever else Grossman’s book is, it is bad social science. ** “Pleasures and Problems of Translation,” The Craft of Translation, eds. John Biguenet and Rainer Schulte, University of Chicago Press, 1989, p. 70. The last two chapters of translator Edith Grossman’s slim new book, Why Translation Matters (2010), are excellent. So let’s start there. One is on the mechanics of translating Don Quixote; the other is on translating Spanish-language poetry, and is packed with side-by-side examples. As a brief guide to How Translation Is Done, one could hardly do better. The arguments are non-technical, the examples are clear, and the reader who is, in the end, dissatisfied with some of Grossman’s decisions has learned something about how translation really works. Grossman was commissioned to translate Don Quixote and given a two year deadline. Best known for her translations of Gabriel García Márquez and other contemporary writers, Grossman says she “repeatedly asked the published whether he was certain he had called the right Grossman” (78). Accepting the job, she had to confront “centuries of Cervantean scholarship,” at least twenty previous English translations, and four centuries of distance from Cervantes and his language. Grossman has a defense of including the errors of Cervantes that is both sensible (she picked an edition and stuck with it, however imperfect) and ludicrous (incorporating Cervantes’ own corrections would “scholarship away that enthusiastic, ebullient quality, what I think of as the creative surge”) (85). The chapter on translating poetry is in part inspired by Grossman’s first-rate 2006 collection of Golden Age Spanish poetry, which I enjoyed way back here and recommend to everyone. My great criticism of that book was that it was too short. Now I can see why. Her method is not honed for speed. Grossman essentially memorizes the poems before translating them, since “I believe that of all these poetic elements, the most important is rhythm” (96). She takes the music and the complexity of the sound entirely seriously. Grossman makes translating poetry seem like such fun. If only her book were titled How Translation Is Done. Where will our underground hymn take place? Forget America, America means vanity again! And there’s a lot of swindling in America, too, I think. So what I want to know is, has anyone written this novel, the novel of Dmitri and Grushenka in America? I want to read it, I mean, if it’s good. Should they stall in New York, with the “wild bears” a perpetual fantasy? Or should the novel be Prairie Karamazov? Myself, I would send them to California. At some point Ivan arrives, and becomes a revivalist preacher. Alyosha, when he shows up, gets involved with unions and enters politics. Or else teams up with John Muir to help create Yosemite National Park. Dmitri never learns English as well as an Englishman, so, according to the unchangeable plan, he can never go back to Russia. When I began this pass through The Brothers Karamazov, I had also just begun Ford Madox Ford’s Parade’s End, a novel written on entirely different principles. Ford gives the very last page of his enormous, eccentric literary history The March of Literature (1938) to Dostoevsky, “the greatest single influence on the world of today” (850). Ford compares Karamazov to Sophocles, and Villon, and “The Victory of Samothrace.” He imagines the future of literature as “the fusion of the genius of Dostoevsky with the art of the impressionists.” I have no idea what that means, but it would be a novel that blends the psychology of Dostoevsky with the “crowd form” of Flaubert, the “mental subtlety” of Henry James, the “kindliness” of Turgenev, the “panache” of Conrad, and the “minute observation” of William Henry Hudson (I mentioned that Ford is eccentric?) I still don’t know what he means, but I want to read that book. Dostoevsky's talent seems to me to be essentially comic and non-novelistic. Vladimir Nabokov argued that Dostoevsky “seems to have been chosen to become Russia’s greatest playwright, but he took the wrong turning and wrote novels.”* Remove the dialogues and monologues from The Brothers Karamazov and there won’t be much book left, and much of what remains are little more than stage directions. Large parts of the book float by free of any but the most minimal details. The speaker here is either the Devil, or a hallucination of the Devil. As such, I should be careful about trusting anything he says. It’s a devil who takes steam baths, goes to the doctor for rheumatism, and writes literary criticism for the newspapers, but still, the devil lies. Nevertheless, this is a pretty good description of The Brothers Karamazov. If I want visually arresting scenes, where do I look? Father Ferapont’s and Liza’s devils, or Alyosha’s dream in the “Cana of Galilee” chapter, or Dmitri’s dream of “the wee one” (506-8). Or Ivan’s argument with the devil, which is mostly a piece of pure stagecraft, but contains the single most detailed character description in the novel. We have seen how the devil appears, but to complete the description, we must know what he is like. “[A] former idle landowner that flourished in the time of serfdom,… gradually fallen into poverty and become a sort of sponger” (636) He plays cards, and is probably single, but if he has children they are under the care of “some aunts” and are never mentioned, although he “sometimes” answers the letters his children send him at Christmas. All of this, to tell us what the fellow, who is actually a hallucinatory devil, looks like. It’s the most purely Gogolian passage in the entire novel, kicking off the most Gogolian chapter. Those children, those aunts, where did they come from? The devil invokes Gogol again and again – quoting The Government-Inspector (1836) (p. 641), taking his nose to the doctor, and then following with a story about a man who lost his nose (to decidedly non-Gogolian syphilis). A story about the devil flying through the air invokes one of Gogol’s Ukrainian stories, I think – I can’t remember which one. One reason I find “The Devil” chapter so good is that it allows Dostoevsky the chance to unharness his inner comedian. I have been relying on two books by Victor Terras, Reading Dostoevsky (1998), and A Karamazov Companion (2002), for hints and tips. Terras argues that Smerdyakov is actually the devil in some sense, an unnaturally born liar and tempter. See the scene on p. 624, where Ivan is reduced to “convulsive fear” at the prospect of seeing Smerdyakov’s left foot, for a key piece of evidence. Terras claims that the devil appears to Ivan at the exact moment of Smerdyakov’s death, which I think is an exaggeration, although the timing has to be pretty close, and the idea puts a keen spin on the devil’s arguments for despair at the end of the chapter – what if he is describing his own suicide, as well as advocating Ivan’s? He immediately gave Smerdyakov the key to the bookcase: “Well, read then, you can be my librarian; sit and read, it’s better than loafing around the yard. Here, try this one,” and Fyodor Pavlovich handed him Evenings on a Farm near Dikanka. The lad read it but with displeasure; he never once smiled, and, on the contrary, finished it with a frown. “What? Not funny?” asked Fyodor Pavlovich. “It’s all about lies,” Smerdyakov drawled, grinning. But what use could the devil have for someone who does not find Nikolai Gogol funny? The context-damaged title quotation can be found on p. 587. * Lectures on Russian Literature, 1981, Harcourt Brace Jovanovich, p. 104. ** The devil has a suspicious resemblance to Ivan Turgenev, as described in Leonard Tsypkin's brilliant 1981 novel about Dostoevsky, Summer in Baden Baden. I hate to think how many of my conceptions about Dostoevsky are based on nothing more than this novel. Then all at once he began speaking loudly, quickly, nervously, gesticulating and decidedly in a frenzy. Now there's a funny line. The "he" is Dmitri Karamazov (p. 370), but it could apply to any number of Dostoevsky characters, in The Brothers Karamazov and elsewhere. His assemblage of neurotics, hysterics, and psychotics is without precedent. I feel fortunate that I do not live in Dostoevsky World. The speaker here is a fourteen year old girl, Liza Khokhlakov, who near the beginning of the novel was “miraculously” cured of her hysterical paralysis. I’m not entirely convinced that Liza is describing a dream. Or perhaps it was Ferapont who was dreaming. Dostoevsky is repeating the scene, adding variations. The truly Satanic sentiment is not the insincere abuse of God, but that very last line, evildoing as a source of endorphins. Pleasure in the face of suffering. Pineapple compote. Liza is obsessed with doors, or Dostoevsky associates Liza with doors. She mentions the door three times in this one passage alone. A few pages later (585), the word “door” appears four more times, interwoven with her other obsession, fingers. The dream of the devils is followed by Liza’s blood libel fantasy, where she lingers on a Jewish child’s fingers being cut off: “The boy with his fingers cut off is good, and to be despised is good” (584). The chapter ends with an act of self-mutilation, a finger crushed by a door. And then, like Father Ferapont, Liza more or less drops out of the novel. Madame Khokhlakov screamed and shut her eyes tightly. I have been claiming, here and there, that Dostoevsky is often not entirely in control of his own novel. This post is part of the argument for the defense. That’s a four hundred page gap between the two (Liza, door, wounded finger) clusters. That’s the way to write a novel. What terrible tragedies realism inflicts on people. "Did you see all the devils around there?" asked Father Ferapont. "Around where?" the monk timidly inquired. Father Ferapont is a barking loon. That “I crossed him to death” is so good, so vigorous and odd, that you’ll forgive me if I double-check Pevear and Volokhonsky against Constance Garnett. “I made the sign of the cross over him three times” – just as I suspected, Garnett clarifies but weakens. Otherwise, her version of the passage is pretty close, and similarly energetic. The Brothers Karamazov is extraordinary in its contradictions. The monks and the monastery are the mainstays of the “positive” theme of the novel. The Christianity of the book is built around Russian Orthodox monasticism. But Dostoevsky’s creativity does not move in straight lines. He puts obstacles in his own path, parodies of his own ideas. Some monks are saints, but others are bullies and hallucinating madmen, terrified of Christ, not the devil, obsessed with literal corruption. Another devil who is “rotten and stinking in a corner” is, in other words, the holy man Father Ferapont. When he appears once more, a few chapters later, the words “rotting and stinking” take on another meaning. I suppose, in today’s well-written novels, the disappearance of Ferapont and all of the other monks just before the middle of the book is a flaw. Dostoevsky works, though, in themes. So I’ll follow the themes. Father Ferapont only exists for a few pages, but those devils – Ferapont is right about them. They’re everywhere. The context-free title quotation may be found on p. 376, in the stark raving mad "Lyagavy" chapter. Or, Karamazovian Aesthetics, Part II, or After Today I Stop Complaining about Dostoevsky. I am afraid I cannot recall if any character in Karamazov ever smiles loudly. I think I would have noticed. Here, Dostoevsky has gotten tangled up in his limited method of delineating this particular character. Alyosha is always murmuring and muttering, smiling weakly and embarrassedly and adverbily. A limited number of combinations are available, and Dostoevsky is in a hurry, so he does not care that this permutation makes no sense. At least that line is bad in an original way. The clichés are worse. A few pages later, a woman’s “eyes flashed with savage wickedness” (767), and not for the first time. Pure nonsense, borrowed from worse novels. Dostoevsky was not the writer to prune this stuff. He did not care. I do care. I want le mot juste, the integrated work of art, perfect at any degree of magnification. Other recent readers complained about structural problems, uneven (whiplash-inducing) pacing, weak characterization, and cavalier use of novelistic devices, especially that off-and-on narrator. What novelist today has earned our trust enough to endure forty pages of "talks and homilies" on religious matters? Dostoevksy has some advice for me, if that's the sort of thing I prefer. He suggests that I spend my time with the books of Ivan Turgenev, and return to Karamazov when I tire of Turgenev's glittery Franco-German trash and want to read about important things. Now, first, reading more Turgenev is an excellent idea, one I hope to pursue later this year. Second, Dostoevsky is not completely wrong. He spent his writing career, post-Siberia at least, trying to push his novels someplace new, someplace he thought Turgenev or Nikolai Gogol could not go. If he had to break the novel in the process, bash it into fragments and tape up the pieces, so be it. Some scenes are in the wrong place. Some sentences are ugly. Some characters make no sense. So what. So what. Did I understand what Dostoevsky meant by that clumsy description of Alyosha?. I did. Then: so what? If I read Dostoevsky wondering why he's not Tolstoy, I'm reading him wrong. Which is certainly my prerogative, but I think I can do better. So after today, no more whining about Karamazov. * “Enough! As Turgenev said.” I want to find out what he’s doing right. One thing, at least. I don’t know if I’ll spend the week on The Brothers Karamazov, but I do know that I will title every post with a brutally miscontextualized quotation. Today’s beauty can be found in the stark raving mad “Gold Mines” chapter, p. 385. All quotations are and will be from the Pevear and Volokhonsky translation, 1990, North Point Press. And before I forget, thanks to Dolce Belleza for organizing the readalong. * Anyone else who wants to whine criticize Karamazov, though, please, pile on! The month is when I hope to write about the book. This is what I do (2007-2009). This is what I do, part 2 (2009-2011). This is what I do, part 3 (2011-2013). This is what I do, part 4 (2013-2015). I too could now say to myself: Be no longer a Chaos, but a World, or even Worldkin. Produce! Produce! Were it but the pitifullest infinitesimal fraction of a Product, produce it in God's name! 'Tis the utmost thou hast in thee; out with it then. Up, up! Whatsoever thy hand findeth to do, do it with thy whole might. Work while it is called To-day, for the Night cometh wherein no man can work.